Ma’ayan Plaut (@plautmaayan) is the Social Media Coordinator at Oberlin College. In an effort to better connect with folks on campus, I’d been toying with the idea of holding office hours for a while (a long while, actually). The communications office’s new location, about a block from the center of campus life, feels a bit removed from what’s going on daily with the people we want to reach most—our engaged, involved and incredibly valuable campus community. I decided to park myself in Azariah’s Cafe in the academic commons of Mudd library with a laptop and a pile of candy. (To quote a student who visited me: “Who doesn’t love candy? 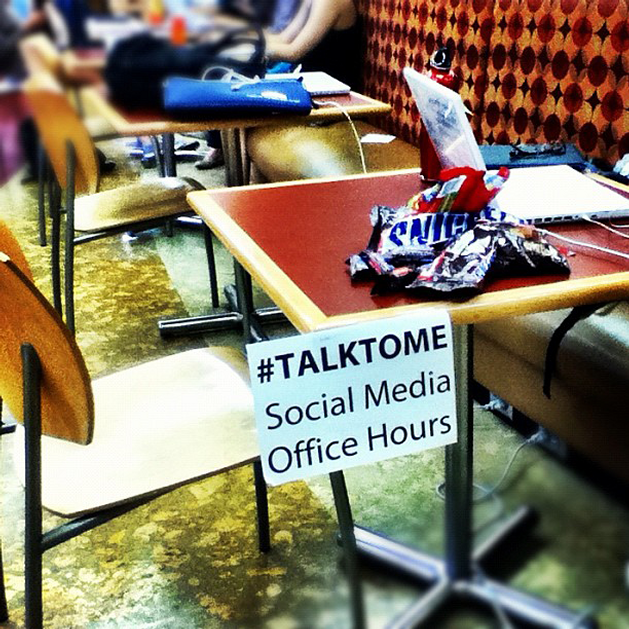 I’d sit down to talk to you if you gave me food even if I have nothing to talk about!”) I hung a sign that said #talktome: Social Media Office Hours and waited to see what would happen. I posted this photo on my personal accounts and Oberlin’s Tumblr in the morning. Followup photo of my table (note the candy!) and the sign when I got to Mudd in the afternoon. learned about a new livestream initiative that’s getting off the ground. had two conversations surrounding the 2012 election cycle, both here in Ohio and nationally (both on using social media to involve students and to better inform the campus about voter registration). had an extended conversation on how to sell yourself using self-created media, specifically, audio and podcasts. provided a how-to for all things publicity, both on and offline, related to the communications office and beyond. engaged in a discussion about social media integration for a new website (a big project, but not impossible). As an example, I mentioned that one of the main buzzwords from a recent conference I attended — engagement— is now an inside joke for those working in social media and higher ed. I explained to the students that this word is extremely important, but it’s nearly impossible to define. This conversation was one of the most engaging experiences of my week. Engagement is finicky, which is why I continue to think about the first word in my job title: social. And in many (possibly counterintuitive) ways, the more I talk to people and the less I sit behind my computer, the more I learn about social media. To paraphrase a commercial—two bags of candy: $6.38; a laptop: free; checkout with my Oberlin ID, talking about social media all day: priceless. 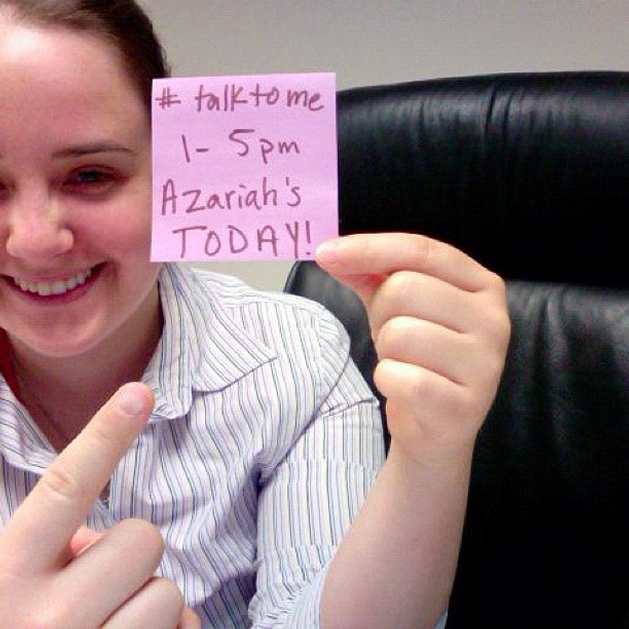 My office hours: a success.